The vultures are three groups of large scavenger birds with bare, featherless heads and a diet mainly of carrion. There are sixteen species of Old World vultures, seven species of New World vultures, and four known species of extinct teratorns. Old World and New World vultures are not closely related to each other. The terms "Old World" and "New World" are somewhat misleading, as the fossil records for both of these groups exist in both places, and no one is quite sure where either group originated. Teratorn fossils, meanwhile, are only found in the New World, and they probably arose there. Old World vultures are found in Africa, Asia, and Europe. They are classified with the eagles, hawks, and kites in the family Accipitridae of the order Falconiformes. Within the family, the vultures are in two groups – subfamily Gypaetinae and subfamily Aegypiinae. 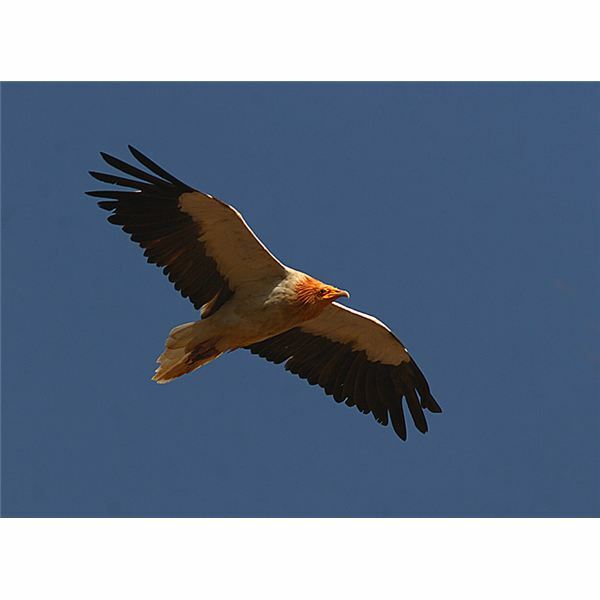 Gypaetinae includes the palm nut vulture (Gypohierax angolensis), lammergeier or bearded vulture (Gypaetus barbatus), and Egyptian vulture (Neophron percnopterus); according to DNA sequence comparisons, these are more closely related to the honey buzzards (genus Pernis) than to anything else in the family. 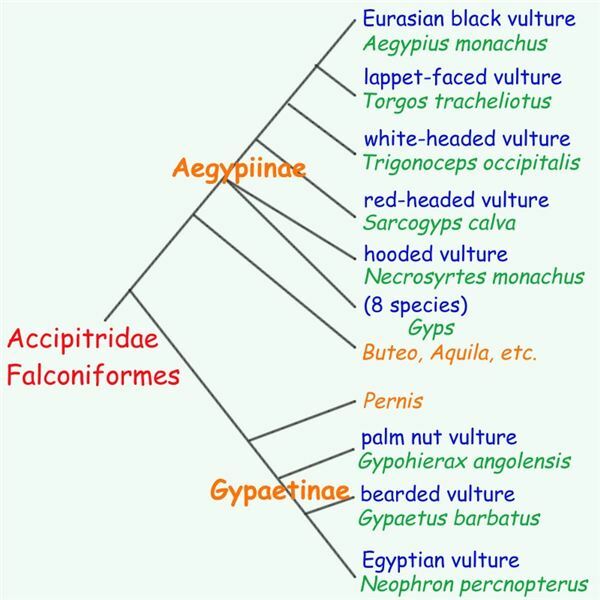 Aegypiinae, which includes the other thirteen Old World vultures, have an ancestor in common with a number of other non-vultures in the Accipitridae family, including Buteo (hawks), Aquila (eagles), Haliaeetus (sea eagles) and Circaetus (snake eagles). The thirteen Aegypiinae vultures are: lappet-faced vulture (Torgos tracheliotus), Eurasian black vulture (Aegypius monachus), white-headed vulture (Trigonoceps occipitalis), red-headed vulture (Sarcogyps calva), hooded vulture (Necrosyrtes monachus), and eight species in genus Gyps – griffon vulture (Gyps fulvus), Indian white-rumped vulture (Gyps bengalensis), Rüppell's vulture (Gyps rueppelli), long-billed vulture (Gyps indicus), slender-billed vulture (Gyps tenuirostris), Himalayan griffon vulture (Gyps himalayensis), white-backed vulture (Gyps africanus), and cape griffon (Gyps coprotheres). New World vultures include the turkey vulture (Cathartes aura), two species of yellow-headed vulture (Cathartes melambrotus, C. burrovianus), black vulture (Coragyps atratus), king vulture (Sarcoramphus papa), Andean condor (Vultur gryphus), and California condor (Gymnogyps californianus). Most of these are found mainly in central and south America, though turkey and black vultures range over a fair amount of North America as well. They are classified together in the family Vulturidae (also called Cathartidae), which started out in the order Falconiformes (diurnal raptors, birds of prey that aren't owls), then moved into Ciconiiformes (storks, herons, ibises), and now might become its own order of Cathartiformes. New World vultures resemble storks in the way they cool themselves by urinating on their legs, which then evaporates and removes heat, a phenomenon called urohidrosis. Only storks and New World vultures do this. Molecular data initially showed some genetic similarity between storks and New World vultures, but more recent studies don't support any kind of close relationship between them. Teratorns were like condors, only bigger. They are thought to have flown like condors, walked like storks or turkeys, and might have been predators rather than scavengers. The species with the most fossils, Teratornis merriami, was only slightly larger than today's extant condors, while Argentavis magnificens was the largest known bird that flew, ever. It might have stood six feet tall, weighed 170 pounds, and had a wingspan of 20-25 feet. The other two species have few fossils and are not as well known; Aiolornis incredibilis was larger than T. merriami, and Cathartornis gracilis was smaller. Teratorns are classified together in the family Teratornithidae, and are closely related to the New World vultures. Presumably they would join Vulturidae in any new order of Cathartiformes that forms. Ecologically, there are also three types of vultures based on which parts of a dead carcass they eat. Rippers specialize on tough parts like tendons and hides – they have the strongest bills, widest skulls, and tend to be the largest vultures. Gulpers feed on softer muscles and viscera, and have the narrowest skulls to better reach their heads deep into carcasses. Scrappers, whose diet consists of scraps, tend to be relatively small with the weakest bills. In the Old World, there are several species in any given area that all compete for the same carcasses. Vultures of the same feeding guild compete most intensely with each other. New World vultures have fewer species and less well-defined feeding structure. The larger, more specialized species went extinct when the Pleistocene megafauna did (sabertooths, mammoths, ground sloths, etc. ), leaving the smaller and more generalist species. Turkey vultures and yellow-headed vultures are able to find food by smell, which allows them to hunt successfully in forests. Black vultures and king vultures (and for that matter all of the Old World vultures) cannot. Black vultures, as a result, tend to live in more open areas, along riverbanks and estuaries. King vultures do fly over forests, but they might find food there more by watching the Cathartes vultures than on their own. Emslie, Steven D. 1988. 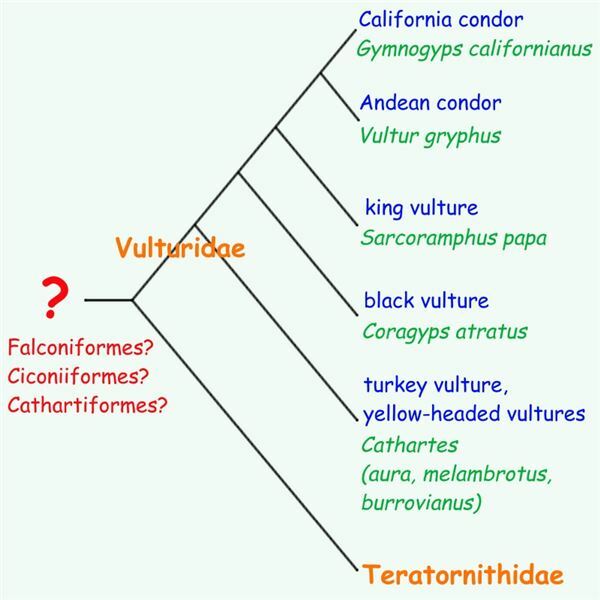 The fossil history and phylogenetic relationships of condors (Ciconiiformes: Vulturidae) in the New World. Journal of Vertebrate Paleontology 8(2): 212-228. Feduccia, Alan. 1996. The Origin and Evolution of Birds p. 298-311. Yale University Press. Hertel, Fritz. 1994. Diversity in body size and feeding morphology within past and present vulture assemblages. Ecology 75(4): 1074-1084. Seibold, Ingrid and Andreas J. Helbig. 1995. 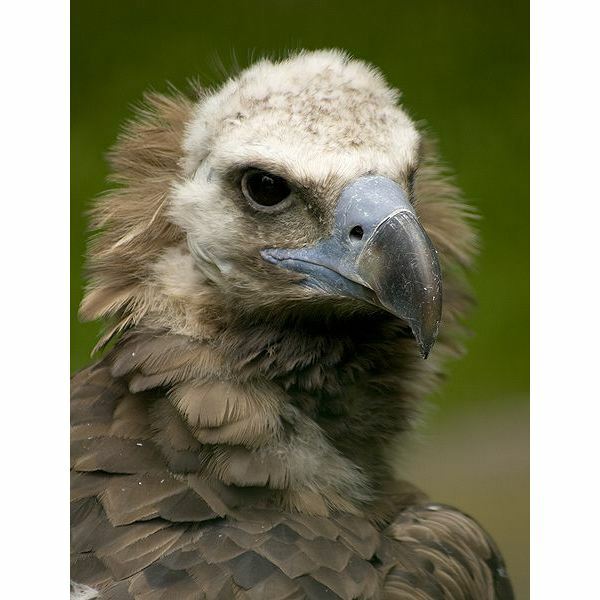 Evolutionary history of New and Old World vultures inferred from nucleotide sequences of the mitochondrial cytochrome b gene. Philosophical Transactions of the Royal Society of London B Biological Sciences 350(1332): 163-178. Eurasian black vulture picture by Julius Rückert. Egyptian vulture picture by Nidhin G. Poothully. 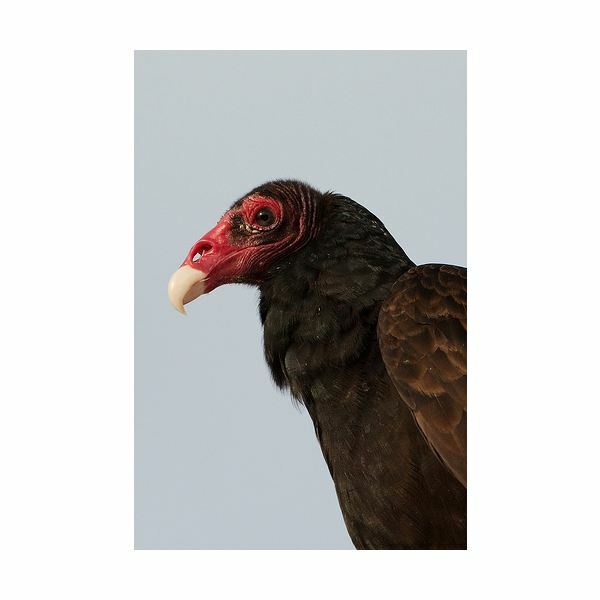 Turkey vulture picture by Dori. Phylogenetic tree figures by article author.